In this article, we will see the comparisons between two insulated water bottles, Corkcicle vs Swell. A lot of people often get confused between these two products. They both are quite fashionable, and they are available in a similar price range. Still, there are some distinctions that you should consider. – Which product that is more recommended for you. 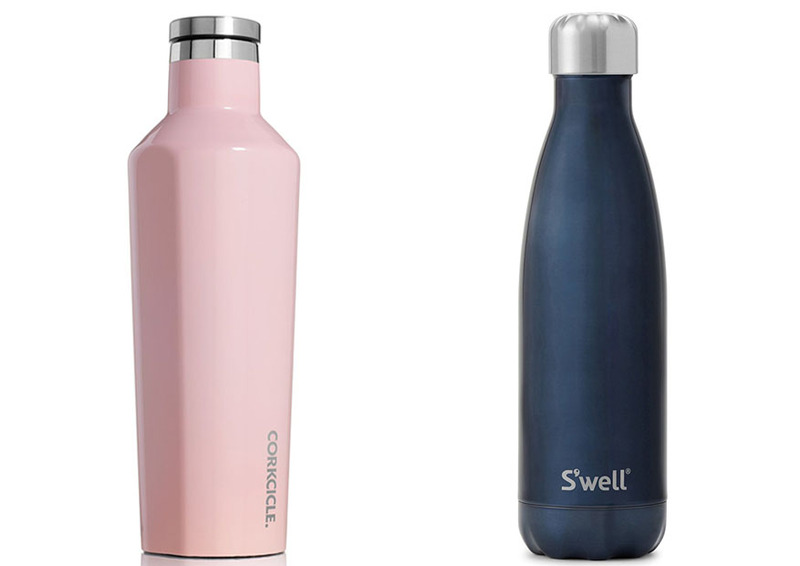 Both Corkcicle and Swell insulated water bottles are available in multiple sizes. Corkcicle has 9 oz, 16 oz, 25 oz, and 60 oz bottles. On the other hand, Swell has 9 oz, 17 oz, 25 oz, and 34 oz bottles. Consider carefully the size that you need. See also: Klean Kanteen vs Hydro Flask. For example, for going to school or work, either 16 oz or 17 oz is usually sufficient. However, if you want something for a full day or more, 25 oz makes a good choice while still being relatively portable. When going in a long trip, 34 oz is good for a single person. 60 oz is suitable when you want to carry enough drink for multiple people. In terms of design, Swell is definitely the winner. This water bottle comes with a sleek curved shape which makes it very solid and comfortable to hold. It also looks stylish and elegant. To make it even better, it is available in various color and pattern choices – there are even artistic patterns with matte or glossy finishes. If you want a truly fashionable water bottle, this is an excellent choice. However, there is some minor weakness about Swell. The opening is a little bit too narrow. The size is actually good for drinking comfortably without any risk of spilling. However, inserting ice cubes into the bottle may be difficult. This is especially true with large ice cubes. Corkcicle is available in multiple color choices – see the complete variants on Corkcicle here. It also looks stylish. The bottom has an anti-slip layer, so it does not tip over easily. The metallic cap looks classy. However, the cap may take some time to open and close. This is somewhat annoying when you are in a hurry. Nevertheless, the opening is wider, so it allows you to insert ice cubes more easily. Both water bottles generally have excellent performance in preserving their internal temperatures. Corkcicle has triple insulated stainless steel layers for enhanced insulation performance. In usage, Corkcicle is indeed the one that can keep cold drinks longer, up to 25 hours. It can keep hot water for more than 12 hours. Swell uses 18/8 stainless steel insulation. The performance is also very good, and it is not far behind Corkcicle. Swell can keep cold drinks for about 24 hours and hot water for about 12 hours. In general, we recommend you to choose Corckcicle. This product has a wider opening which allows you to insert ice cubes easily. It also has better insulation which can keep cold and hot drinks for longer.